Students in the residence halls will see security cameras and alarmed pull stations for fire alarms this semester when they walk down their building’s hallways and through its common spaces. The decision was ultimately made to add security cameras to various locations within the residence halls after the racial bias incident that occurred in Humbert Hall this past September. 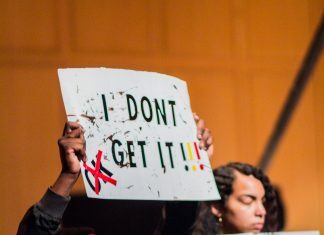 “After that bias incident, we had done a survey of all students in the residence halls, and we tried to see if people’s support really was in favor,” said Myrna Hernandez, dean of students. Discussion to add security cameras to DePauw’s residence halls, however, is nothing new. “Several years ago we had talked about camera usage in general, and students really weren’t in favor of it. This time it was that many more students were in favor of it in common areas,” Hernandez said. The main issue surrounding the talk of adding security cameras then were privacy concerns. However, the security cameras will only be added to public spaces with the residence halls such as common areas, stairwells, and entrances. Although this semester’s first-year students were in favor of the cameras when the email survey was sent out asking for their input after the racial bias incident occurred, some students still had reservations about adding security cameras to the residence halls. Moreover, the footage security cameras collect will only be reviewed if an incident occurred. Regardless, the security cameras will begin to be installed this semester and into the summer months once the Board of Trustees approves of the funding. The alarmed pull stations are in the earlier stages of planning, but will also be added to DePauw dormitories. “We’re still pricing out the options to look at what the cost will be, but our hope is to do that project this summer,” Hernandez said. It was decided to begin the project to add alarmed pull stations after the increase of intentional pulls this past Fall 2017 Semester. “Monon weekend, alone that Saturday night, the fire department came 13 times in one night to campus, all over,” Hernandez said. Alarmed pull stations are an additional security measure to the regular fire alarm to decrease intentional pulls, which would also cause students to take the fire alarms going off seriously. Additionally, the added alarms can potentially catch the perpetrators that intentionally pull the fire alarms, since it is a felony. “There’s an alarm before you can pull the station. There are some that [have a camera], so they will take a picture,” Hernandez said. Security cameras and the alarmed pull stations will begin to be added to residence halls this spring.